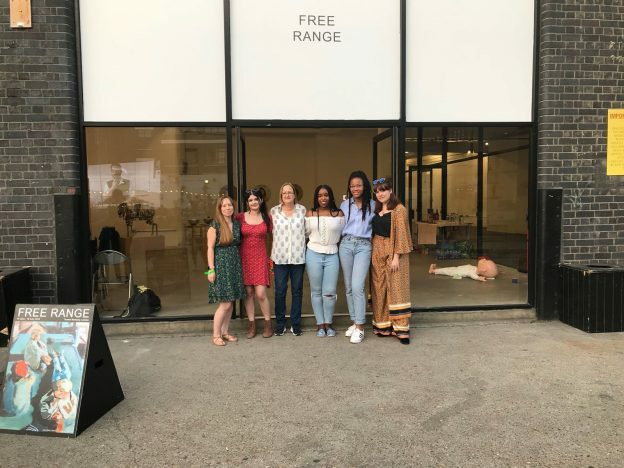 Between 6th – 10th July, Pay Gaps and Thigh Gaps, an exhibition by a group of graduating SMFA Fine Art students was on at Old Truman’s Brewery in Brick Lane, London, as part of Free Range – A season of Graduate Art & Design Exhibitions. Established in 2001 to showcase the work of emerging creatives, thousands of students have exhibited at the shows, taking over Old Truman Brewery spaces each summer and connecting with a London audience. It aims to celebrate talent and provide a platform for UK artists beyond education. The show was extremely successful, with an amazing turn out. There seems to be a growing precedent that in order to be recognised as a female artist you must limit your practice to being ‘feminist’. But why can’t a woman speak beyond her gender to gain recognition? We are a group of proud feminists who would like to share varying concerns beyond our genitalia (and possibly surrounding our genitalia- we would like the option). From, childhood imagination, to personal illness, we come together with uniquely different practices, to support each other as artists… who happen to be female. This entry was posted in Campus online, People, Student Guide and tagged Campus online, Canterbury, Medway, Student Guide on 13 July 2018 by Sophia Cheraitia.